There was a keynote presentation by Dave Cupples at Affiliate Summit East 2012, which took place August 12-14, 2012 at the Hilton New York in New York City. Dave started his first business aged 4 & by 15 was earning thousands in affiliate commissions. Dave topped the University of Sydney in eMarketing as well as graduating with First Class Honours in Law. While still a full-time student he turned a hypothetical assignment into a successful online store ApeShop, winning the Sydney & NSW Business Awards, NSW Young Entrepreneur of the Year & being featured on Channel 9 & Sky Business Television. In April 2011 Dave was the winner of SMX Idol at SMX Sydney, voted Best Speaker by the audience. Dave has travelled the world speaking at leading conferences including the largest Affiliate Marketing Conference in Australia, Affili@Syd, the largest in Europe, A4uExpo in Munich, & the largest in the world, Affiliate Summit in New York City. 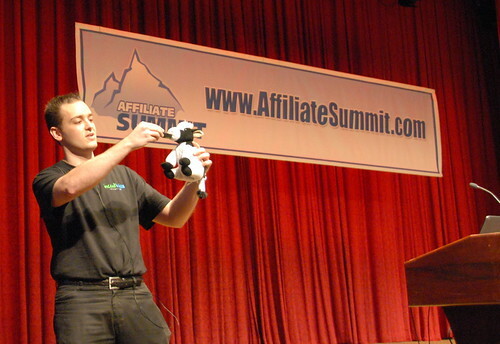 More details on Affiliate Summit at http://www.affiliatesummit.com/.